Persona tells a fascinating tale. Those Japanese sure like having teenager casts, with heroes saving the world at an age as young as 15 at times. This game stays true to the young protagonists tradition, with the main character and his friends being high schoolers. This time, it’s not the whole world that’s at stake, but merely their hometown, but obviously they still have to put their lives on the line and fight to save it. The ambitions of a man named Takahisa Kandori, the head of the local brach of the SEBEC corporation, have led to this peril, with the town being flooded by mysterious demons who attack the helpless citizens. The premise sounds generic enough, but it’s not long before it becomes clear that there’s more to this game than just simply the good guys chasing down the bad guy. 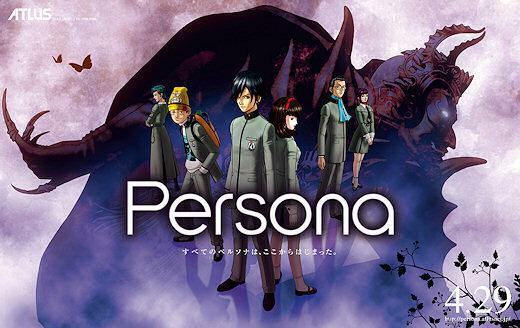 In the very beginning, the protagonist and his friends try to summon a Persona, despite it seeming like believing in a fairy tale to most of them, because one of the school kids, Hidehiko, claims that they are real. Something strange happens and they all pass out, the protagonist meeting a masked man called Philemon in his dream. Once they are found by the school doctor, they’re sent to get checked at the hospital, where their friend and fellow schoolgirl, the kind-hearted, but chronically ill Maki is. 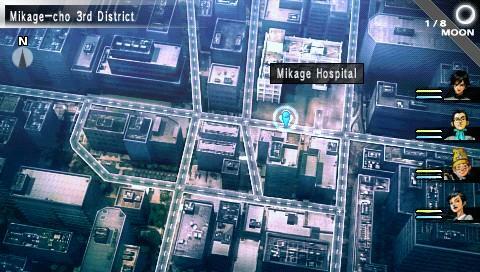 Persona is rather unorthodox, as it offers two different branches in the story. Playing normally, you will most likely end up on the branch where you have to go after Kandori, but there is apparently another possibility, if you do things in a certain way – the so-called Snow Queen quest which is based on a supposed legend told at the St. Hermelin High School where the characters study. I did not go down that path on my playthrough, so I couldn’t really talk about it, but its very existence is a very interesting aspect to the game not seen often elsewhere, adding significant replay value. Furthermore, whether you go on one or the other path is determined only 1/6 or so into the game, so it’s almost like two games in one. As I said earlier, the game features a silent protagonist. He does not even have a canon name, you have to input his first and last name, as well as nickname, in the beginning of the game. The idea is clear – the writers want the player to associate with the character. It works relatively well, especially given the fact that there are numerous situations through the course of the game where your character is being asked something and you can select an answer among nicely formulated choices that allow you to “walk your own path” in the game, so to speak. Future events in the game could depend on your answers. The rest of the cast have well-defined personalities and decent background. Hidehiko (nicknamed Brown) is my favourite among them with his jokes and his confidence, even if it seems quite forced, like compensation for his fear at times. He and the brave, straightforward, funny cap-wearing Masao (Mark) have a kind of a rivalry going. Clearly shown already in the beginning of the game, it lasts throughout the whole game and their interactions are always interesting and add dynamic to the story. The calculating rich boy Kei Nanjo also adds much, with him usually being the brain in the party’s operation. And finally, Maki, with her positive attitude, provides a nice counter-balance to the boys alongside her, completing a party of varying personalities. There’s a whole lot to be learned about the characters in the party, and they themselves develop nicely through the course of their adventure. 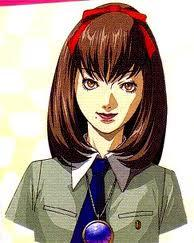 Hidehiko is in fact an optional character, but he was the one that was in my party in my playthrough. There are three other possibilities for his place, Elly, Ayase and Reiji, the former being very beautiful and popular at school, the latter being a kind of a badass, and Ayase being just a regular ditzy teenager. Yes, you do meet and converse with them even if they never become a part of your party, but my experience with them is limited, so I really couldn’t say much. There are also a few decent supporting characters, most of them met at the school, but the cast aside from the main characters is nothing to write home about. There’s hardly any interaction with generic NPCs, too. As for Kandori, the “bad guy” in this game, he is relatively typical, and only towards the end does he receive some development to differentiate him from just any regular villain. The strength of the cast really lies within the 4 party members (the protagonist being practically a blank slate). While the game starts in a traditional fashion, with an isometric view of the main character being able to walk around the rooms and talk with the others (and do change the setting “Upward Movement Orientation” in the System options in the in-game menu to “Upper-Right,” trust me. Otherwise, controlling your character is very awkward), you only have to get out of a room to enter the fancy “corridor” view, which is actually first-person view (а la the original Phantasy Star) with a small map on the bottom left so that you can have an easier time navigating through the building. As the majority of the game is spent in dungeon-crawling, you will have to get used to this view – not that it is particularly difficult to get used to, after the initial minute or so of learning how to make your way around, everything should go smoothly. The “world map” (“town map” is the more appropriate term here) is also rather weird, with your characters represented by a small cursor that you move around streets to reach and get into certain buildings. Naturally, there are random battles as you move around the map. 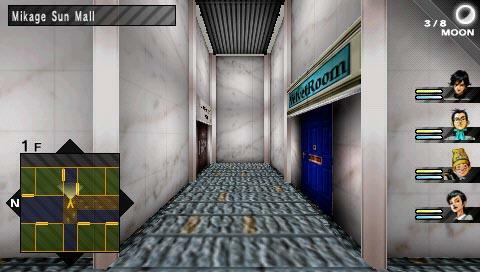 There are several sections like the one pictured to the town, you can visit the school, police station, hospitals and doctor’s offices (for healing for a fee), malls (to buy items, create Personas in the Velvet room or play in the Casino), subway and more particular buildings, like the SEBEC headquarters. The save points are called “Agastya trees,” they are present inside dungeons and other buildings, and there are a few even on the overworld. 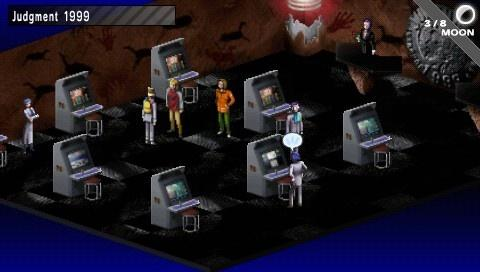 Battles in Persona are generally fun, I cannot remember many cases when I felt bored with them. Before a battle even starts, you can choose to negotiate with the demons (and sometimes they even speak to you first!) and persuade them not to fight you or even get their spell cards which are used to create Personas. You communicate with demons using one of four commands for each of the characters (so, with the usual party of 5, you’ve got 20 commands available), and demons respond positively or negatively depending on their nature. Some of the commands are Invite, Sing, Dance, Taunt, Joke, Chat, Cringe, Bribe, etc. Different demons like different stuff, they have four possible states (Anger, Eagerness, Fear, Happiness) – getting them angry will cause them to attack you without you being able to retaliate for that turn, and getting them eager makes it possible to gain their spell cards (if your level is high enough in comparison to theirs). 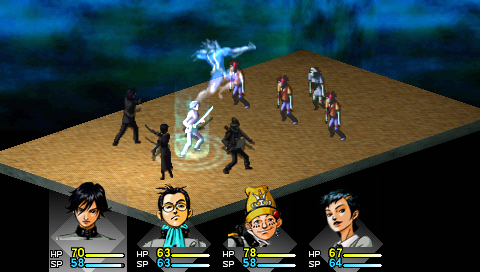 Once you start fighting, you can attack the demons in 3 ways – physically (with your equipped weapon, where every character carries a specific weapon type), with your gun (again, each character usually has his/her own), or by summoning your currently equipped Persona to do a special attack (which can be of many types, such as physical, elemental, tech, status, etc.). Summoning Personas triggers an animation of the Persona executing its attack, but fear not, there is the handy “Skip” option (enabled/disabled with the Start button during a battle) which speeds up that process and the battles as a whole greatly. Defeating the demons yields experience points, while negotiating with them doesn’t (except when they decide to grant some experience to the character who successfully completed the negotiation), so, despite the ability to avoid it, you’ll find yourself fighting a lot of the time. Speaking of needing experience, there are a couple of points in the game where, unfortunately, you’ll have to grind a few levels to be able to progress because the bosses are very tough. This becomes necessary in the last two big dungeons of the game, so at least you don’t have to worry about this rather tedious task until very late in the game. A cool feature is that you get to choose which stats to upgrade for your main character (sadly, not for the rest of the party, though) as you go up a level. Aside from the very beginning, money is usually not a problem in this game, you’re usually able to buy the best gear for most, if not the whole party. By the end of the game, you have an excessive amount that you can’t buy anything better with. Do stock up on recovery items, though. Unless you overdo the grinding, the final battles offer pretty good challenge and you’ll need them. The Velvet room is where you can create and take on new Personas by combining the spell cards of demons you’ve previously obtained. Creating one Persona requires two spell cards of different demons, and the combinations between them are numerous. By adding an item during the fusion, you can improve the resulting Persona’s stats, have it learn an extra ability, or even have it change to a completely different (and usually more powerful) Persona via the usage of a handful of special items. All this is done with the assistance of Igor, a recurring figure in the series. 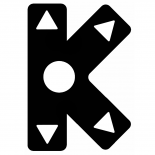 Here’s the place also for a few words for the Casino, the game’s only source of mini-games. Judging by the name, one would expect stuff like slots, poker and black jack here, and that would be correct. There is one special game here, called Codebreaker, which is enjoyed quite a bit. It’s a combination of bulls and cows and sudoku, and it’s fascinating once you learn how it works. Some of the prizes in the casino are weapons and items you can’t otherwise obtain, so one could spend a considerable part of the game here, though, aside from 6-7 Code Breaker games, I chose not to. I already said a bit about how the game looks, the style of the original is basically preserved, but there are many cleanups and niceties like the sharp character portraits helping the game not look too outdated. The most impressive part about visuals by far is the presence of many anime cutscenes in the game. They are fully-animated and very beautiful, adding a lot to the story presentation. There’s a special “Movie mode” where you can view all the scenes you’ve viewed so far in-game and, apparently, half of them alone are in the Snow Queen branch – so there’s another reason to play through the game at least twice. As a whole, the beginning of the Persona series leaves rather lukewarm feelings. The mechanics work well, but there’s nothing particularly impressive. The story, while being the game’s strongest point, still leaves a lot to be desired in comparison to the finest in the genre. Still, however, it deserves praise for tapping into a territory not very common for the genre – psychology, with relative success. The demons and Personas come from all kinds of different mythologies, creating an interesting, if a bit random, mix. The members of the main cast are likeable, but not particularly memorable. The visuals and soundtrack are nice, but hardly something to tip the scales if you’re deciding whether to play this or not. Still, I would recommend this game to JRPG fans with more time on their hands or fans of later Personas who wonder about the series’ roots. But if you’re not so lucky with your time or you’re not into Persona, perhaps your gaming hours are best spent elsewhere.